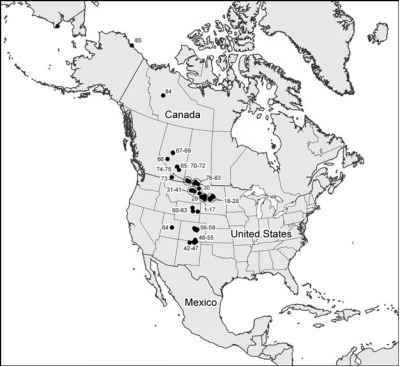 Figure 7.1 Map of North America showing approximate locations of areas in which K-T boundary localities occur in nonmarine rocks. Each dot represents one or more (as many as 12) individual localities. Numbers are keyed to Table 2.1 and Appendix. the barren series. It is also present in numerous locations on the eastern side of the basin, and in many places the boundary can be recognized by a distinctive, thin (1-2 cm) claystone unit visible in outcrop, even at a distance (Figure 7.4). In most places where the boundary claystone has been identified, a thin coal bed closely overlies it. 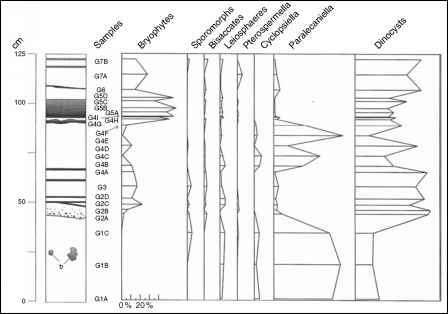 An important difference in the stratigraphic setting of the K-T boundary in the Raton Basin from that in the Williston Basin is this: in the Raton Basin, the boundary is entirely enclosed within a coal-bearing interval, the Raton Formation. The fine-grained rocks of the Raton Formation contain abundant plant megafossils and palynomorphs, but with the exception of a few dinosaur tracks, vertebrate fossils are absent, likely an artifact of depositional environments unfavorable for their preservation. Figure 7.2 Geological map of the Raton Basin showing approximate positions of K-T boundary localities discussed in the text. In all, 13 fully documented boundary localities are known in the basin.